Nicci Haynes, Sonic Pencils, 2016-2017, pencils, bare electronic components, cardboard. 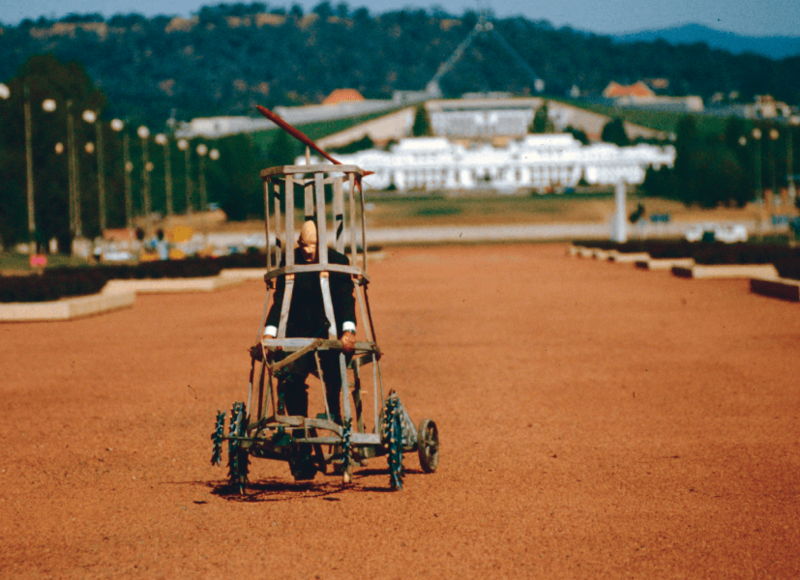 Arthur Wicks, Armoured Car on ANZAC Parade (photographic still from performance), 1990. Pia Van Gelder, Recumbent Circuit (detail), 2016, electronics, speakers, wood, dimensions variable. Brian McNamara, Micro Touch Mk II, 2017, IC, wire, LEDs, plastic, wooden microscope box, 25cm x 35cm x 11cm. Stelarc, Propel (performance still), 2015, HD video with stereo sound, 2’00” duration. 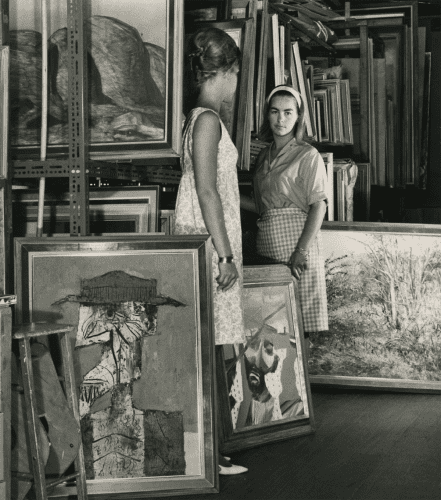 When we experience art it is often a case of look but don’t touch. The group exhibition Ex Machina turns this notion on its head and presents a refreshing critique of the role of technology in artistic experience. 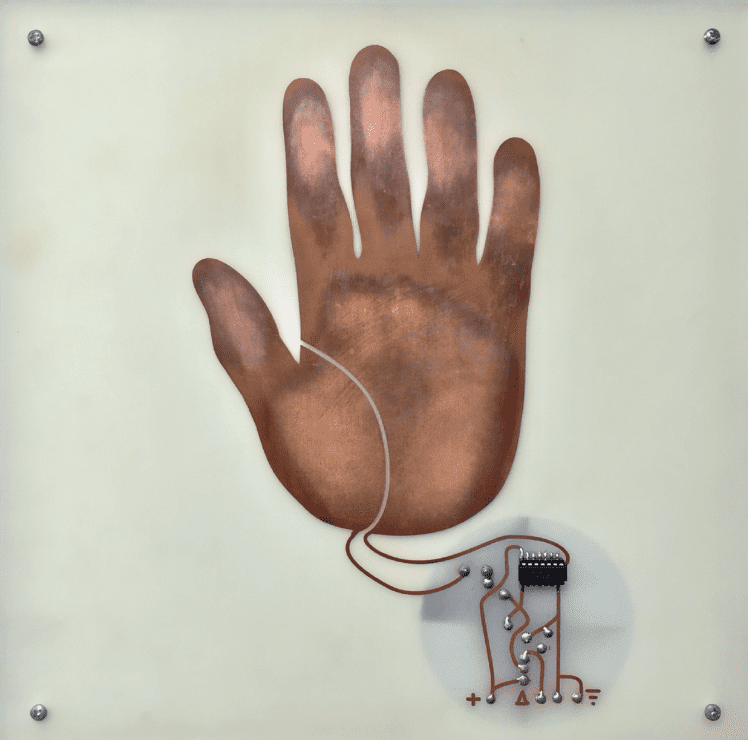 CCAS Gorman has been transformed into a mad scientist’s laboratory with works that hang dormant ready to come alive as you complete their circuits, literally. Nicci Haynes’s durational performance Radio Radio, 2017, stands poised to engulf the entire CUBEspace room by the end of the show. By the single press of a button, Haynes invites you to activate a mass of wires, coils and batteries and engage in a multisensory experience. White noise mixed with broken language fills the room as the crystal radio receivers pick up signals in the atmosphere. Haynes has crafted an immersive experience lulling you into the Twilight Zone. In the MAINspace gallery, a selection of Brian McNamara’s steam punk-esque creations sit awaiting your touch as their wooden enclosures contrast with digital hearts. 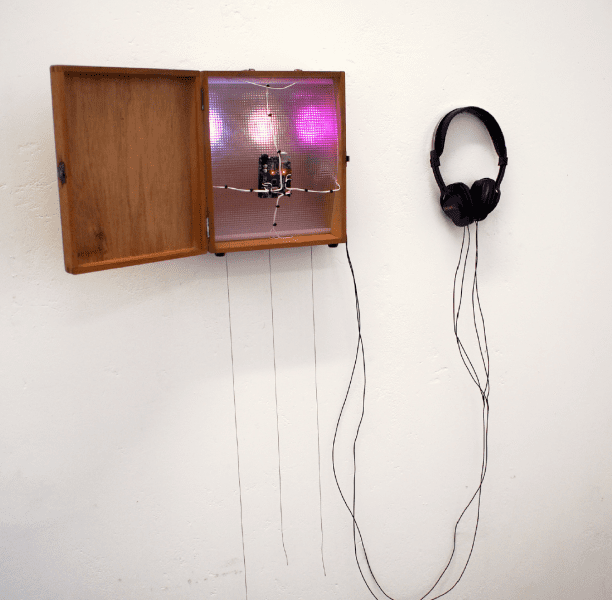 The threads of Micro Touch Mk I, 2017, entice the audience to stimulate the work and create sounds reminiscent of the Beach Boys classic Good Vibrations. Moving around the space, McNamara’s deceptively simple Automaphone, 2015, grabs your attention. Sitting on a pedestal in front of a black wall is a pile of paper, a black permanent marker and a wooden triangular prism. A few blinking lights and a couple of slits in the prism are all that hint at the mysterious complexity within. Using the marker and a sheet of paper McNamara invites you to create your own two-dimensional masterpiece and ‘feed’ the machine. Much like pianolas that respond to holes in paper, the Automaphone interprets the binaryelements of your drawing to create a unique musical arrangement. Haynes’s scientific background continues to shine through in Sonic Pencils, 2016-2017. 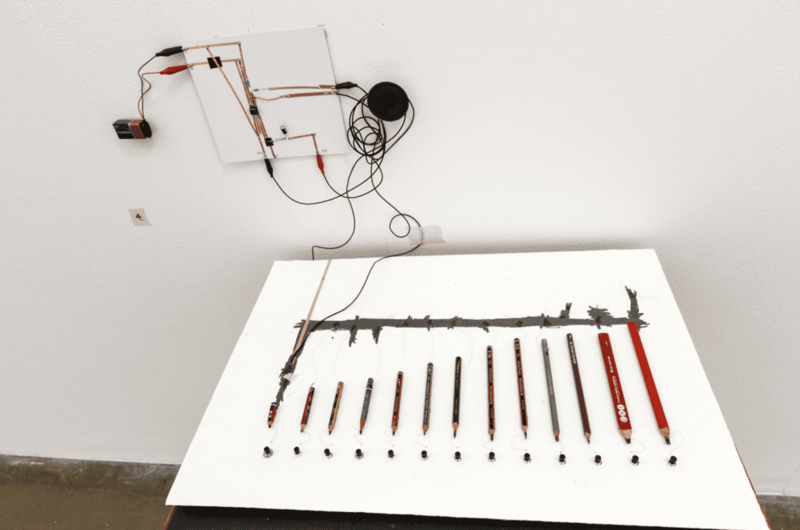 As the title suggests, the artist harnesses the electrical conductivity of graphite pencils to create a synthesiser instrument. It soon becomes apparent that the length of graphite influences the pitch of the output. It’s almost as if the pencils ‘draw’ the sound from the graphite, through conductive paint, and towards the speaker. Unlike other sound pieces on display, Sonic Pencils provides greater control to the user. You can compose the next rendition and make your own impression on the soundscape. In Ex Machina, curator Alexander Boynes has produced an exhibition that offers both fresh ideas and historical context. 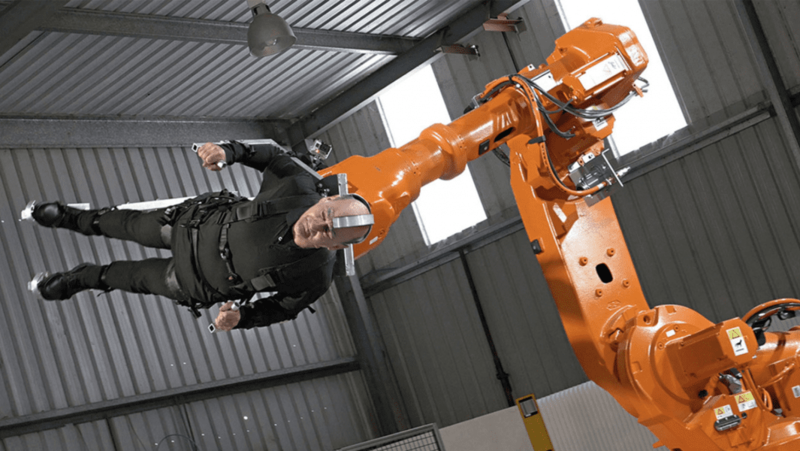 The documentary material on works by Stelarc, grandfather of the machine/body interface in Australian experimental art, gives you a foundation to develop an understanding of Australian kinetic-mechanical art within a global context. Projections of Stelarc’s exoskeleton performances remind us of the power struggle between technology and humanity. It is a conflict that we all must manage. The works in Ex Machina will inspire, intrigue and delight with their nonsensical and mysterious existence. Take a visit to this mad scientist’s laboratory to explore a new dialogue between art, technology and experience.